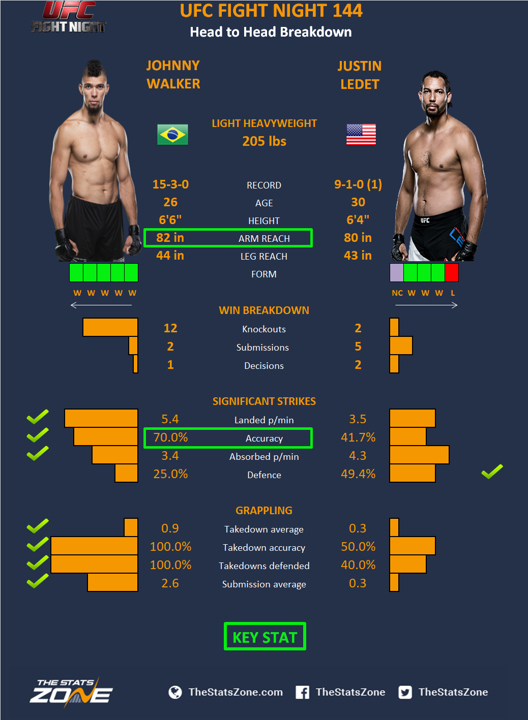 The charismatic Johnny Walker will walk out on home soil to make his second UFC appearance, and it seems like he is being fast-tracked to the top of the light heavyweight division as he has been handed the dangerous Justin Ledet. Ledet suffered only the first loss of his career in his last fight against Aleksandar Rakić and has a lot of potential in the division, but this is a huge test for him. Walker is extremely dynamic considering his huge frame and his striking caught everyone's attention when he dispatched the knockout artist Khalil Rountree on his UFC debut. Ledet is very tough but he will hope this fight stays at close range to improve his chances of finding a submission. Walker has a clear edge when it comes to striking, and Ledet is also giving up a height and reach advantage which is unusual for him and will be an important factor. This is because Walker is nasty from range. He is dangerous, and aggressive with all eight limbs, and despite his 6’6” frame he is very athletic and is expected to use these attributes to finish the fight inside three rounds. Striking and grappling stats sourced via FightMetric.